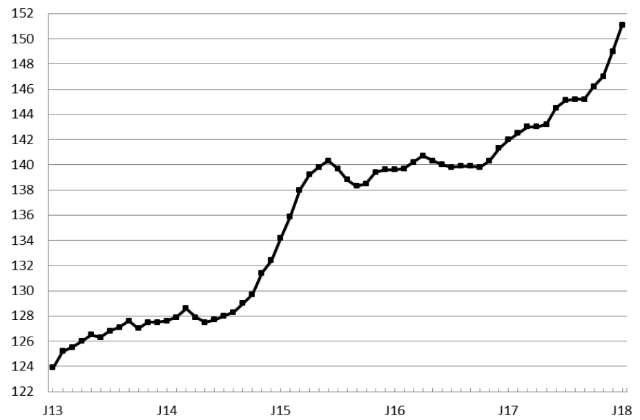 The trend in the USD Index of Leading Economic Indicators since January 2013. The University of San Diego‘s index of leading economic indicators rose 1.4 percent in January to an all-time high. The Burnham-Moores Center for Real Estate’s index showed all six components rising for the second month in a row. The index stood at 151.1, surpassing the previous high of 150.8 reached in May and June of 2000. “Leading the way were big gains in building permits, help-wanted advertising, and the outlook for the national economy,” according to the report. The encouraging forecast for the San Diego economy was ironically released on the same day as a major pullback in the stock market sparked by rising interest rates that ended the worst month for investors in two years.